All-vegetarian August continues today, dear readers! And I think today’s post might be also be a record for “fewest photos taken while trying a new recipe”. Not because I was lazy or forgetful, but because the recipe is just that easy. You’ll see. Let me back up for a second. 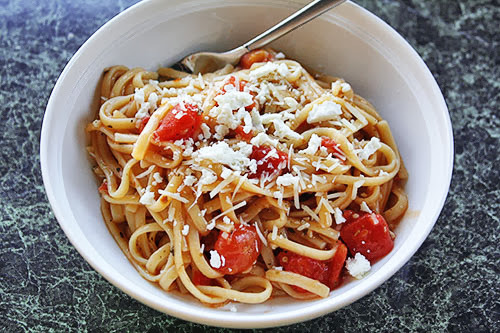 When it’s time for a meatless meal in Casa P, our go-to is spaghetti. 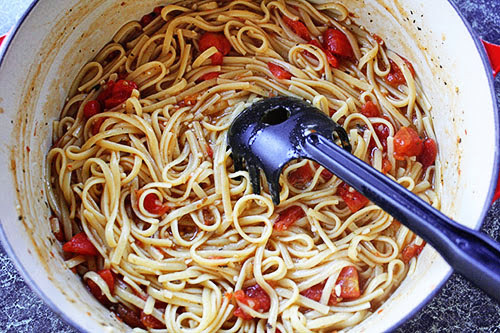 One box of noodles, one jar of sauce (Ragu’s 7-Herb Tomato because duh). Don’t get me wrong; it’s tasty enough for our small family’s simple tastes. But jarred ingredients always make me feel like I’m cheating. Or worse, like I’m failing to control our basic nutritional needs (pre-made foods can have sodium levels that are OUT OF CONTROL). So I prefer to make my own stuff, when I can. But marinara can take so much time to simmer and reduce, ugh. That’s why I wanted to try this recipe – supposedly originally from Martha Stewart, discussed here, and repeated here – for a One-Pot Wonder. Or as Beth calls it, a Wonderpot. An Italian Wonderpot! Also known as “I want to make a dish that is slightly fancier than spaghetti, but with similar taste and ease”. It follows the same basic premise of the Miracle Mac & Cheese, in which you cook the pasta in liquid to create a thick sauce. Let’s get started! 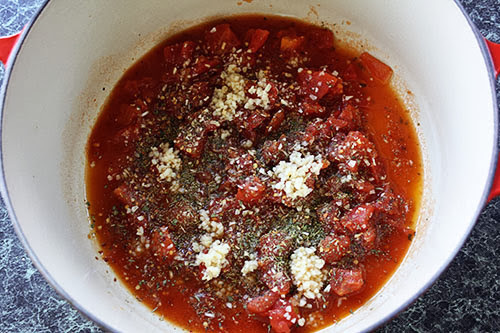 Throw a 15-ounce can of diced tomatoes (don’t bother draining them) and some minced garlic, basil, dried onion, red pepper flakes, and good ol’ fashioned Italian seasoning into a pot. I used my Le Creuset, but you don’t have to use a fancy dutch oven. Note the reappearance of my favorite measurement, “some”. Any recipe that involves “some” of something is bound to be easy! Then add four cups of vegetable broth (low-sodium... you can always add salt later! ), half a cup of white wine, and twelve ounces of uncooked linguine noodles. I debated for a hot minute whether to add more “stuff” – I had a can of artichokes in the pantry, and frozen veggies in the freezer (Beth’s version uses frozen spinach). But in the end, I decided to keep it simple for this first go-round. I did my best to submerge all the linguine in the liquid, then put the covered pot on high heat until the liquid was boiling. Once it was bubbling, I turned the heat down to medium, and stirred every few minutes. Mr. P has converted me to a mushy-pasta eater (my nonexistent Italian readers are weeping for what passes as “al dente”), so I cooked it until the noodles were fairly soft, which took about fifteen minutes. But! You can take it off the heat sooner. The starch will thicken whatever liquid remains, no problem. It sure doesn’t look like much, but if you’re a basic pasta lover like me, this is pure unadulterated pasta delight. It’s far more of a margherita pasta than spaghetti, and the super thick, starchy (I’ll be honest: borderline gummy) sauce means it can hold its own as a main dish. And of course, it’s just begging for experimentation with other veggies – but it’s also perfect as-is. Well, perfect with some parmesan and goat cheese on top. I mean, really. 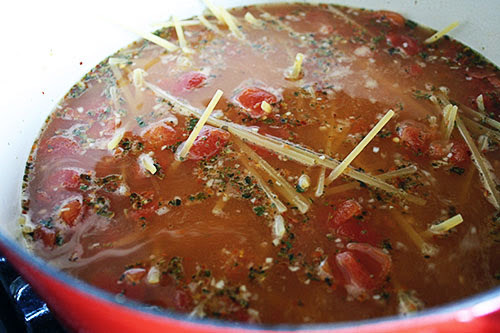 Give this a try instead of jarred spaghetti sauce on your next spaghetti night! Hope you enjoy! Friday: French bread pizza and salad! Everyone else seems to be in a French bread pizza mood, which put me in the mood as well. Saturday: Date night! Let’s hope for nice weather and al fresco dining. If I had not just made a massive batch of spaghetti sauce (with meat) last week, this recipe would be on the menu in our home this week. 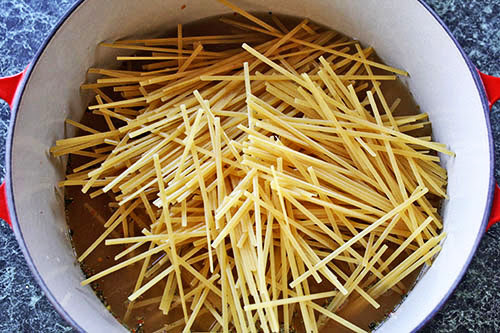 Ahh but the next time we have spaghetti, I'll give this one a try. This sounds delicious!! What wine did you use? @Rachel, I just used regular white cooking wine - store brand maybe? Bottled wine is reserved for drinking in Casa P! I think I could eat this every day. My life will be easier because of this! Who would have thought? I love it, I add zucchini, squash at the last few minutes. My goodness gracious it is delish!